Pedro Romana (ca. 1460-1536) was probably born around Cordoba where he was active from 1488 to 1536. He apparently specialised in large religious paintings, especially altarpieces for a number churches in Cordoba. He was elected president of the painters' guild in 1515 but his fortunes must later have taken a turn for the worse, for in 1528 he was arrested for debt. This painting originally formed the left lateral panel of an altarpiece, the destination of which has not been identified yet. The centre was The Virgin and Child, Hispanic Society of America Collection, New York, and the right lateral panel a Visitation (sold Kende Galleries, New York, 1942). 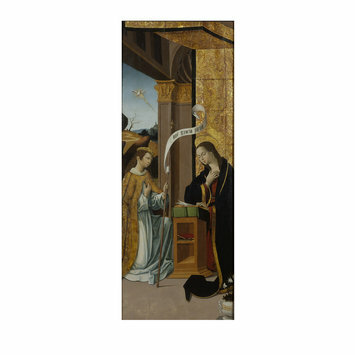 The present painting depicts the Annunciation, an episode from the life of the Virgin, which illustrates the Incarnation of Christ. The picture is pervaded with Christian symbols such as the lilies and the pomegranate (on the gilded dado), which allude respectively to the purity and chastity of the Virgin. The overall composition shows the influence of both Flemish and Italian art and can be dated from the late years of Romana's career. On the left, the Virgin Mary reading a book on a lectern, with a gilded dado behind her, on the right the archangel Gabriel knelling before the Virgin, holding a sceptre to which is attached a scroll inscribed with the words ‘Ave Gratia plena’, in the left background a landscape with a town, a leafless tree and a winding path. Bequeathed by Rev. Alexander Dyce, 1869. South Kensington Museum Art Handbooks. The Dyce and Forster Collections. With Engravings and Facsimiles. Published for the Committee of Council on Education by Chapman and Hall, Limited, 193, Piccadilly, London. 1880. Chapter I. Biographical Sketch of Mr. Dyce. pp.1-12, including 'Portrait of Mr. Dyce' illustrated opposite p.1. Science and Art Department of the Committee of Council on Education, South Kensington Museum.A Catalogue of the Paintings, Miniatures, Drawings... Bequeathed by The Reverend Alexander Dyce. London, 1874. A 'Note' on page v comments, 'This catalogue refers to the Art portion of the Collection bequeathed to the South Kensington Museum by the Reverend Alexander Dyce, the well-known Shakespearian scholar, who died May 15, 1869'. The Catalogue. Paintings, Miniatures, &c. by Samuel Redgrave notes of the 'Oil Paintings', 'The strength of Mr. Dyce's valuable bequest to Department of Science and Art does not lie in [this] portion ... which is in its nature of a very miscellaneous character. The collection was made apparently as objects offered themselves, and without any special design.' Dyce's main interest was in literary subjects, and this is reflected in many of the paintings he bequeathed to the V&A. 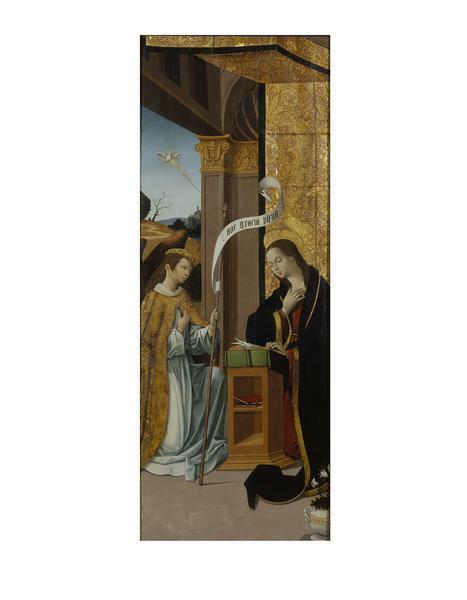 Historical significance: Formerly attributed to Giovanni dal Ponte (1385-ca.1437) in the 19th century and then to the School of Nice, this painting was identified as a fine and rare example of Pedro Romana's art, who apparently executed only religious pictures (Post, 1950). This work was originally the left lateral panel of a large altarpiece with at the centre The Virgin and Child, Hispanic Society of America Collection, New York, and on the right a Visitation (sold Kende Galleries, New York, 1942). The present painting depicts the Annunciation, an episode from the life of the Virgin, which took place when the archangel Gabriel (depicted here dressed in white, kneeling before the Virgin) was sent by God to the Virgin Mary. The angel's announcement that Mary will bear a boy and call him Jesus as well as the dove of the Holy Spirit descending towards her symbolised the Incarnation of Christ. The motif of lilies in a vase in the right lower corner is a symbol of the Virgin's purity, which echoes Gabriel's scroll inscribed with the words 'Ave gratia plena', normally followed by 'Dominus tecum': 'Greetings most favoured one, [the Lord is with you]'. The woven silk of the cloth of honour behind her is adorned with a pomegranate pattern which alludes to her chastity. The Virgin is traditionally presented holding a book which refers to the prophecy of Isaiah (7:14): 'a young woman is with child (Vulgate: 'Virgo concipiet') and she will bear a son…'. The virgin appears exactly identical in the three panels, which suggests the possible use of a cartoon. The capital tops in the three pictures feature the same decorative motifs while the Virgin appears with a similar outfit (a scarlet dress covered by a gold-trimmed dark blue mantle). The overall architecture looks very similar in the three panels and may have been influenced by Italian models while the lectern refers to Netherlandish compositions. The rich gilded dado delimits a space within the space but echoes as well the lavish mantle of the angel, signifying thus that Mary belong to a different world but that she was chosen and therefore enjoyed a particular status. The main argument to attribute these paintings to Romana lies in their similarity with an Adoration of the Magi from the altarpiece in the church of Espejo, Cordoba, which is signed. Compare to this Adoration, Dyce.2 and its companion pieces look more refined than the Espejo altarpiece, which suggests that they can be dated around the end of Romana's career and after the execution of the Espejo altarpiece. Another painting currently attributed to Pedro Romana, The Virgin and Child in the Museo de Bellas Artes, Cordoba (CE2165P), dated 1488, displays as well very similar architectural features and identical decorations of the top of the throne's arms. The landscape with a winding path, the deep blue sky without clouds appears to be typical of Romana's personal manner (Du Gué Trapier, 1962) whereas the overall compositions illustrate the taste for the Italian Renaissance and linear perspective during reign of Charles V in Spain (1516-1556). The altarpiece formed by the three panels illustrates three different moments of the life of the Virgin and may therefore have been destined to a church consecrated to the Virgin, which however has not been identified yet. C.M. Kauffmann, Catalogue of Foreign Paintings, I. Before 1800, London: Victoria and Albert Museum, 1973, pp. 243-244, cat. no. 302. C. R. Post, A history of Spanish painting, x, p. 203 ff., fig. 74. E. du Gué Trapier 'Tres paneles de un retablo por Pedro Romana' in Archivo Español de Arte, xxxv, 1962, p. 70, pl. iii (all three panels repr.). H. A. Gaya Nuño, La pintura española fuera de España, Madrid, 1958, p. 291, no. 2506.